Trifles are a decadent dessert full of contrasting flavors and textures. They are beautiful to look at and delicious to eat. 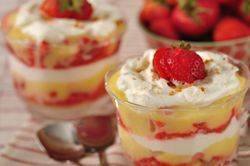 This Strawberry and Lemon Curd Trifle is no exception. It starts with a layer of buttery pound cake, followed by a layer of strawberry sauce and fresh strawberries, then a layer of tangy and smooth lemon curd, that is tempered by a layer of softly whipped cream. If you eat this Strawberry and Lemon Curd Trifle right away the flavors of each layer are distinct. But I find it best to chill it in the refrigerator for several hours, or even overnight, so all the flavors have time to soften and mingle. This is sure to become a favorite. So let's begin. While this recipe make a large trifle, enough to serve about 12 people, you can also make it into individual servings (as in the above picture). The recipe will make about 10 single servings depending on the size, of course. Since this Strawberry and Lemon Curd Trifle recipe has quite a few layers, it is a good idea to make what you can ahead. That way all you need to do is assemble the trifle a day or two before it is to be served. So you can make the pound cake, strawberry sauce, and lemon curd ahead of time. In fact, you can make and freeze the pound cake up to a month ahead and the strawberry sauce and lemon curd can be made up to a week in advance and simply stored in the refrigerator. Also, the beauty of the trifle is that variations exist for every layer. If you don't like pound cake, use a sponge cake, a butter cake, or even ladyfingers. Although I have not soaked the cake in alcohol, you can sprinkle the cake with a little sherry or a liqueur. And while I have used strawberry sauce you could replace it with another fruit sauce or even a jam or preserve. Other berries or even peaches, pears, kiwi can be used for the strawberries. The next layer is typically a custard or pastry cream followed by whipped cream. For this recipe, I have replaced the more traditional custard with lemon curd, followed by the softly whipped cream. The Strawberry and Lemon Curd Trifle is finished with crushed Amaretti cookies or shortbread cookies (store bought or home made). Toasted nuts or fruit could also be used to decorate the top of the trifle. Read more about the English Trifle. Strawberry and Lemon Curd Trifle: Have ready the pound cake, the strawberry sauce, sliced strawberries, lemon curd, and whipping cream. To make the whipping cream: In the bowl of your electric mixer, or with a hand mixer, whip the cream, sugar, and vanilla extract until stiff peaks form. To assemble: In the bottom of your trifle bowl place slices (about 1/3 inch thick) of the pound cake. Fill in any gaps with extra pieces of the cake. Pour half of the strawberry sauce over the pound cake. Top the strawberry sauce with half of the sliced strawberries. Then pour half of the lemon curd over the strawberries. Top with half of the whipped cream. Repeat the layers. Cover and refrigerate for 8 and up to 24 hours to allow the flavors to mingle. Just before serving sprinkle the top of the trifle with the crushed Amaretti or shortbread cookies. Serves about 12-14 people. Preparation Time 30 minutes. Note: This trifle can also be made into individual servings (as shown above). Simply follow the recipe for the large trifle only instead of using a large trifle bowl, use small glasses (about 1 cup (240 ml)). Makes about 10 individual trifles.